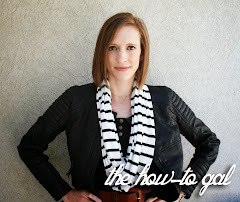 For those of you who having been reading The How-To Gal since Christmas and saw my Christmas Gift Guides know that I have sort of a complex about giving the "perfect gift." Giving gifts any other time of the year is no different. Thank goodness for the world wide web, am I right?? So much inspiration and awesome gift ideas. When searching for gifts I usually consult Giverslog.com's gift guides, get inspiration and create or buy that perfect present. Get out and play with your kids! Simply find a globe at your local thrift store and paint with chalkboard paint! That chalkboard painted globe is genius! Oh - gotta do the chalkboard globe for my girls! !